and the second Saturday of the month from 1pm-3pm. Our mission is to strengthen community spirit, maximize human potential, and respectfully address social and environmental issues. Adopting an atmosphere of trust and collaboration that says, "Everybody has equal value regardless of education, socio-economic class, or social situation." A Time Bank is a community of people who support each other. At its most basic level, Time Banking is simply about spending an hour doing something for someone in your community. That hour goes into the Time Bank as a Time Dollar. That Time Dollar is available to spend having someone do something for you. It's a simple idea, but has powerful ripple effects in building community connections. With Time Banking, you will be working with a group of individuals who are joined together for the common good. It brings out the best in people, because Time Banking is a system that connects unmet needs with untapped resources. 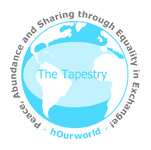 If you would like more information about The Tapestry Time Bank please contact us. You are also welcome to join us at one of our Orientations or Socials, please check upcoming events for dates and times. Join us for a fun evening listening to local musicians -- some may even be Tapestry members! Please mark your calendar and plan to attend for friendly conversation and fine food. We meet at 6pm and order food at 6:30pm unless otherwise noted. Check out our Fantastic Organizational Members!